Martin Springett was born in Crayford, Kent, England, in 1947. He studied art (that is he learned to play the Guitar) for two semesters at the Brassey School of Art in Hastings, Sussex. He emigrated to the West Coast of Canada in 1965, but returned to the UK in 1973 to pursue music in various bands. He spent time in Germany, and toured through Europe. While in London Martin started to illustrate and design record covers for Columbia records. Upon his return to Vancouver, Martin carried on with music and illustrated various books and magazines. 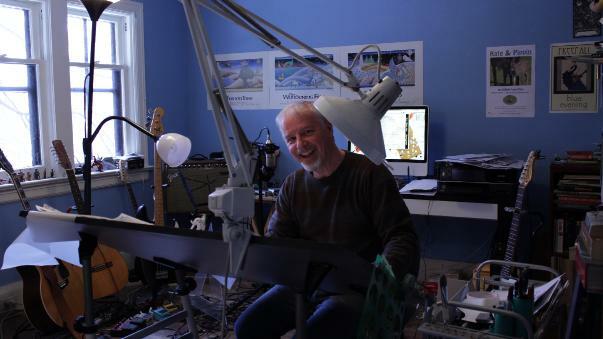 In 1978 he moved to Toronto, maintaining activity in every area where illustration is required. He released his own album, “The Gardening Club”, in 1983. In 1984 Martin was commissioned to illustrate the cover of “The Summer Tree” by Guy Gavriel Kay. This and the subsequent volumes of The Fionavar Tapestry Trilogy were published around the world along with Martin’s covers. Martin continued his work in fantasy illustration, illustrating many covers for fantasy novels, including “The Traveller In Black” by John Brunner. In 1990 he illustrated his first childrens book, “Mei Ming and the Dragon’s Daughter” written by Lydia Bailey. Martin has just finished illustrating his sixth childrens book, called “The Follower” by Richard Thompson. He has been nominated for various awards, including the Govenor Generals Award For Illustration. He has won the Aurora Award For Excellence in Fantasy Art, and two Silver Awrads from the Art Directors Club of Toronto and Best Classical Record Cover of The Year Award (UK). 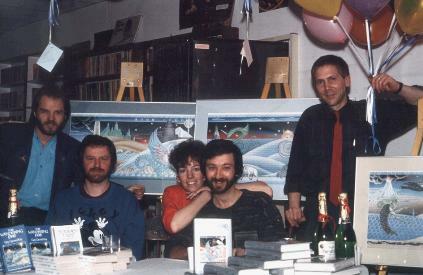 Left to right —- Michael Hale, book designer, Martin in Mickey shirt, Sue Reynolds who drew the maps for the books, Guy Kay and John Rose, the affable owner of Bakka Books in Toronto where the launch was held in 1986. Martin still pursues the Musical Muse and has several projects on the go.